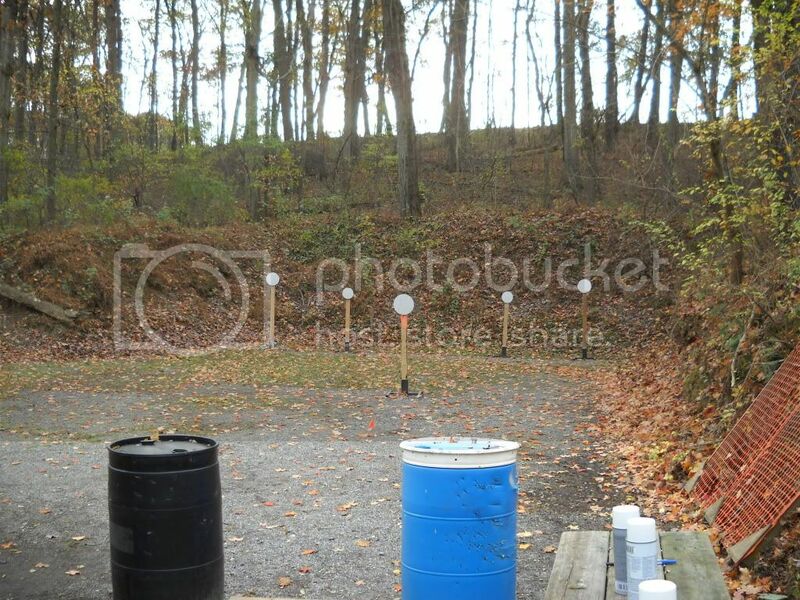 Anyone here planning on shooting at York IWLA Steel Challenge on Oct 31st? I have been wanting to do this for awhile but never did folllow up. Anyone shoot a steel challenge match before? Any other newbies that would like to try it out with me or am I gonna have to just embarass myself alone? I'd like to try steel shooting but I only have a 22 single action revolver at the moment. Maybe next year after getting the tax refund. 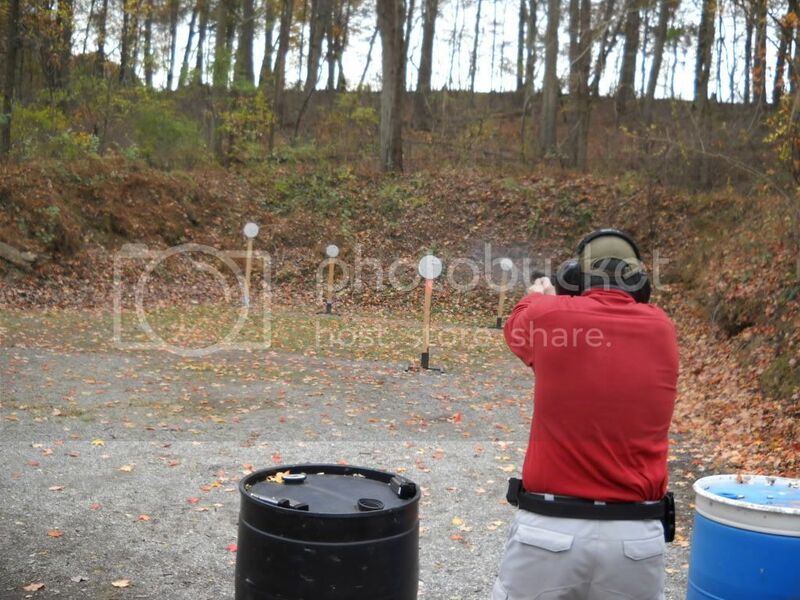 Anyone here planning on shooting at York IWLA Steel Challenge on Oct 31st? I have been wanting to do this for awhile but never did follow up. Anyone shoot a steel challenge match before? Any other newbies that would like to try it out with me or am I gonna have to just embarrass myself alone? I may consider it, but I'd have to take the day off of work. I was thinking about the fun shoot there (a week or two) earlier. I may just go to watch, and if I'm just going to watch, the steel challenge may be more fun to see. I've never shot competitively before. I guess that the good thing for you if I decided to shoot in the event, is that you could be sure that you wouldn't be the worst one there. I say this only because my 12 year old son recently out shot me (he hit a bulls eye with his weak hand after shooting over 100 rounds). If I go, I'll let you know as soon as I can via PM. Where is this, I've never done a match like this but what the heck. I only have a double mag pouch for my Gold Cup, so that gives me 3 on the line. Would I need more on the belt? Isaac Walton League is in Dallastown. I looked up some videos on YouTube of some Steel Challenge shoots and it gave me a good idea of what to expect. Since you shoot each stage 5 times (5 shots each stage so a total of 25 rounds....IF I don't miss!) I have 2 double mag pouches so that will put 4 on my belt and I am just going to keep one in my pocket. I am certain I won't be breaking any speed records or anything.....just looking at doing something different and fun. I am either going to shoot it with my Beretta Elite II or PX4 Storm....have not decided yet. For the Steel challange Match you will need 5 mags per stage and you can place them on a table, or any number of mags and a loading buddy, it usually works out that a squad member will load mags for you. Each of the 5 strings are shot independantly of each other, and there is no speed mag changes or physical movement involved. Most of the you tube videos will be very helpful. You can shoot almost any handgun, center fire, rim fire, auto or revolver (double action), scoped or iron. Occasionally even carbines. There are some power factor requirements, so hot load magnums, and even some factory .45 is not allowed. We will have a chrongraph setup for testing that. As to the funshoot on the 23rd, it is a very nice low key venu for an introduction to group competitive shooting. You can take it as seriously, or not as you like. Shot todays match with my Beretta 92G Elite II. Next time I will probably shoot it with a .22. Last edited by JohnUSCG; October 31st, 2010 at 04:22 PM. 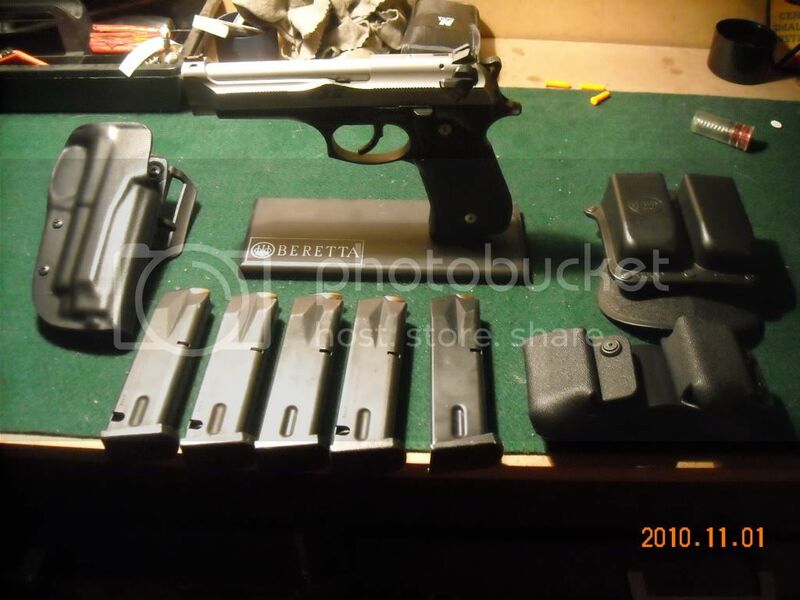 Beretta 92G (9mm, Decocker only) Elite II - Dawson Fiber Optic front sight/flat black rear. (Elite II comes stock with some other goodies like 'D' spring and skeleton hammer, etc. Fobus and Blade tech double mag pouch. MINIMUM of 5 magazines. LOTS AND LOTS of these are readily available for the 92. This is the basic stuff I use also for the Fun Shoots. I have the same setup for my PX4 Storm as well. SOoooooo....as you see, it doesn't take lots of fancy gear or much $$ to get going. I really enjoyed shooting the Steel Challenge and look forward to more.